In conjunction with KAIROS, the CFUW-Ottawa Exploring Indigenous Education Study and Interest Group is hosting a Blanket Exercise. The KAIROS Blanket Exercise program is a unique, participatory history lesson—developed in collaboration with Indigenous Elders, knowledge keepers and educators—that fosters truth, understanding, respect and reconciliation among Indigenous and non-Indigenous peoples. The KAIROS Blanket Exercise is a workshop that explores the nation-to-nation relationship between Indigenous and non-Indigenous peoples in Canada. Blankets arranged on the floor represent land and participants are invited to step into the roles of First Nations, Inuit and later Métis peoples. The workshop helps people to understand how the colonization of this land impacts those who were here long before settlers arrived. It engages people’s minds and hearts in understanding why the relationship between Indigenous and non-Indigenous peoples is often broken and how we can take action together. 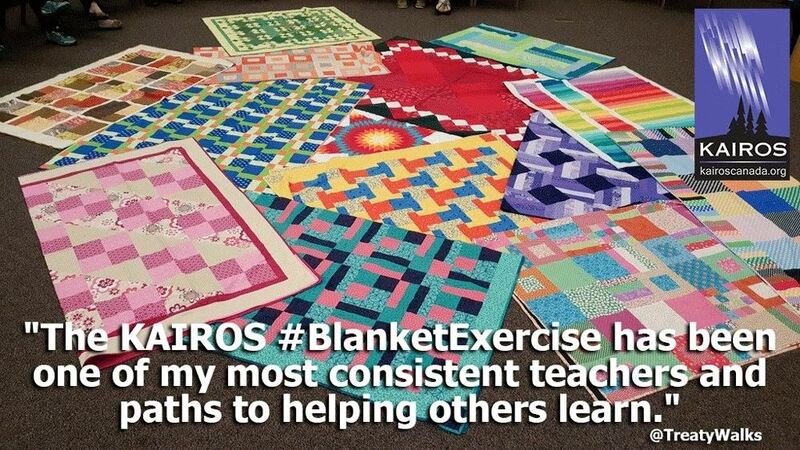 Click on https://vimeo.com/107962612 to learn about the Blanket Exercise. A limited number of spaces are available to CFUW members. Cost of the exercise is $25. To register, email Martha Musgrove, musgrom@hotmail.com. Registration ends April 18, 2019.